Today, Teragren is one of North America's largest manufacturers of environmentally friendly bamboo flooring, stair parts, trim, panels, veneer and butcher block countertops. And our mission hasn't changed. Passionate about the environment Bamboo flooring was a scant segment of the U.S. flooring market when avid environmentalists Ann and David Knight saw the need for environmentally sound building products. They co-founded the company they would eventually name Teragren based on the principles mentioned above, insisting upon high standards, ISO-certified factories and an ongoing effort to measure and improve the way Teragren works. Dedicated to uncompromised quality The key to exceptional quality—and the ability to guarantee it—lies in controlling manufacturing. That is why Teragren makes all our own bamboo products. As the manufacturer of all Teragren bamboo products, we control production from harvest to distribution. We specify materials and processes that meet stringent European, Japanese and U.S. environmental standards and we set the bar very high when it comes to the beauty and performance of our products. Our stringent manufacturing specifications call for Optimum 5.5® Moso bamboo that is harvested sustainably only at maturity between 5-1/2 to 6 years when fibers are most dense. As a result, Teragren bamboo averages 25 percent harder than red oak and 12 percent harder than North American maple. 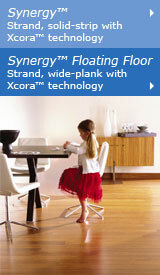 Our Synergy™ strand bamboo flooring with Xcora™technology is 154 percent harder than red oak and 66 percent harder than non-strand Teragren bamboo flooring, making it perfect for high-traffic residential and commercial interiors. 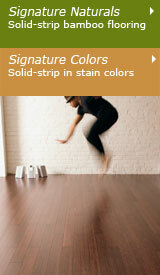 Expanding distribution Solid-strip, traditional bamboo flooring was Teragren's first product. Over the years we've expanded our line to include wide-plank and floating floors; natural, caramelized and stained flooring; flooring stair parts and trim; panels, veneer and most recently parquet butcher block for countertops and tabletops. We offer beautiful, high-performance bamboo flooring options for virtually every type of installation and provide an abundance of complementary products to allow you to complete your design from threshold to tabletop. When Ann and David Knight became majority shareholders in 2001, the company undertook a vigorous expansion plan, adding new products like matching stair parts and coordinating panels and veneer while broadening our distribution network. Today, Teragren flooring products are available through exclusive flooring distributors and retail flooring dealers in all 50 states, Canada, Australia, New Zealand and Africa. Our panels and veneer are available nationwide through fine distributors. Teragren ships select flooring, trim, panels and veneer worldwide direct to a customer's nearest port from our factory in China or from one of our stateside distribution centers. Architects, designers, builders and consumers are finding Teragren's complete line of bamboo products a valuable asset. Visit our product gallery and you'll see Teragren products that have been installed in libraries, museums, offices, restaurants, retail shops and multi-family high-rises, as well as new and remodeled homes. Keeping our principles In 2006, Teragren was named by Inc. magazine as one of "The Green 50" companies that are setting the standard for environmentally friendly business, and as one of the top 10 local "Greentrepreneurs" by Seattle Metropolitan magazine. In addition, in August 2007, Teragren was named one of Inc. magazine's 5,000 fastest growing companies in America. While he continues to expand environmentally sound development through Teragren, David Knight is nurturing the next generation of environmental leaders as a board member of the Environmental Leadership Program. He has also worked with Business for Social Responsibility (BSR) Fortune 500 members exploring ways to mitigate container ship emissions. Teragren is also working closely with the renowned Bainbridge Graduate Institute's pioneering MBA program in sustainable business to measure and mitigate our environmental footprint. Teragren follows the principles of The Natural Step, a program that focuses on applying basic concepts of sustainability. Teragren products also contribute to one or more credits within the U.S. Green Building Council'sLeadership in Energy & Environmental Design (LEED®) Green Building Rating System™. Questions to ask before you buy As with any product you use on a project, you want to have confidence in the quality, durability and consistency of the bamboo flooring, cabinetry panel, countertops/table tops or veneer that you select. Here are some questions to ask as you search for the right bamboo product and the right bamboo source. 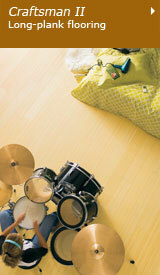 Is all bamboo flooring alike? No. Some bamboo floors are more durable than others or emit varying levels of volatile organic compounds such as formaldehyde, depending upon how they are manufactured. Teragren's floors are FloorScore®-certified, which means they've all been tested for 78 VOCs. You’ll enjoy peace of mind knowing that Teragren floors have achieved one of the most rigorous indoor air quality standards in the world. You can also expect from Teragren a variety of flooring styles, colors and installation methods. Information on our specifications and test results, including the Janka hardness test, is available here on our web site. Is there a grading system for bamboo flooring? No. Hardwood flooring is graded (No. 1 Common, Select, etc.) according to certain standards. However, no U.S. or international grading standards exist for bamboo flooring. You must rely on the manufacturer's standards and warranties. Teragren bamboo flooring, for example, comes with a lifetime structural warranty and a 25-year residential/10-year heavy-use commercial finish warranty (except for Spectrum and Elements flooring). How hard is the bamboo? Hardness is the main factor in durability. Bamboo flooring can be as soft as pine and harder than maple depending on the species of bamboo used and when it was harvested. Teragren specifies only Optimum 5.5® Moso bamboo harvested at maturity (5-1/2 to 6 years) when fiber density peaks. As a result, Teragren bamboo averages 25 percent harder than red oak and 12 percent harder than North American maple. (Teragren's Portfolio and Synergy™ strand bamboo with Xcora™ technology is 154 percent harder than oak due to our optimized manufacturing process.) Here on our web site, you will find Janka ball test results and other performance data on every Teragren product. What kind of finish is used? A durable finish is the first line of defense for lasting beauty in wood floors. On Teragren prefinished products, we use a water-based, solvent free, 7-coat German finish with an aluminum oxide wear layer to boost abrasion resistance, including two polyurethane topcoats for added protection. Developed with internationally known Klumpp Coatings, the finish carries a 25-year residential/10-year heavy-use commercial warranty. How much formaldehyde is in the adhesive? All bamboo products are laminated, and the industry standard for this laminating process has long mandated the use of urea-formaldehyde adhesives. However, some urea-formaldehyde adhesives emit much less formaldehyde than others. Teragren's proprietary manufacturing adhesives emit 0.03 ppm or less of formaldehyde, much less than allowed by U.S. OSHA, German E0, CARB Phase 1 and Phase 2, and Japanese JIS/JAS (F☆☆☆☆) emissions standards. Many of our products are available formaldehyde-free by special order. 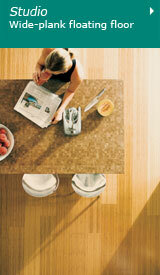 Our countertop/table tops are made with formaldehyde-free manufacturing adhesives. Does all bamboo flooring qualify for LEED® credits? No. Flooring, like any product used in LEED certified construction, qualifies only if a company can provide documentation under the U.S. Green Building Council's LEED® Green Building Rating System™. Does all Teragren bamboo flooring qualify for LEED® credits? Yes. All Teragren bamboo products have such documentation and contribute to LEED certification under MR Credit 6: Rapidly Renewable Materials. All Teragren flooring products have also been FloorScore®-certified, a standard that qualifies them to contribute to LEED® v3 IEQ credit 4.3: Low-Emitting Materials—Flooring Systems. Teragren products made with non-urea manufacturing adhesives, including traditional bamboo flooring, panels and veneer made with our proprietary IEQ 4.4 urea-free adhesive, our strand bamboo flooring, panels and veneer and our formaldehyde-free bamboo countertops and table tops—also contribute to IEQ Credit 4.4: Low-Emitting Materials—Composite Wood and Agrifiber Products. Call Teragren at 800.929.6333 or send us an email for more information. Are CSI specifications or MSDS available? Only a manufacturer can provide documentation to certify CSI (Construction Specifications Institute) specifications, MSDS (Material Safety Data Sheets) or other legal specifications required by architects and other design professionals for commercial and government projects. As we are the manufacturer of all Teragren products, we make such documentation available conveniently through our web site. Is product readily available? Teragren maintains supplemental inventory at two distribution centers in the United States to be certain that our stocking wholesale distributors and the retailers they serve are able to fulfill orders on time. What coordinating products are available? Teragren is the only bamboo flooring manufacturer that provides a full spectrum of coordinating flooring, stair parts and trim, architectural casings, floor vents, panels, veneer, edge banding and countertops to help you complete your design. All of our panels and veneer are SCS Indoor Advantage™ Gold-certified, which means they comply with California Special Environmental Requirements Specification 01350, designed to ensure health through good indoor air quality.